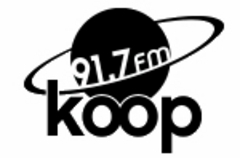 KOOP is a community radio station owned and operated by its members. Any member of the community can apply to produce a radio program, and KOOP provides facilities and training. KOOP has about 60 different locally-produced programs airing every week. Each of these programs is produced by an individual member or by a collective of members. KOOP provides a diverse array of programming, emphasizing programs that deal with local issues and/or serve communities which are under-served by the mainstream media.